I think it would be hard to find a pilot who has not seen or is not atleast familiar with the movie One Six Right: The Romance of Flying. 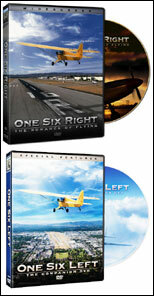 One Six Right is an exceptional aviation documentary about the Van Nuys Airport. Although, I had seen One Six Right I was not aware of a companion DVD, One Six Left until about a month ago. Netflix delivered One Six Left to my home in time to view it over the weekend. If you enjoyed One Six Right I highly recommend you check out One Six Left. The DVD features the beautiful trailer "Into the Clouds" which features music by Enya, a 12 minute movie montage of amazing aerial shots of a wide variety of planes that fly in and out of Van Nuys. Additionally, the video has interviews with the Director and the videographer and a few other features. This was one of those films that just connects with a pilots love for aviation. The cinematography is spectacular and should be used by any pilot that is trying to convince a friend or family member to learn to fly. The great news is Brian Terwiliger the Director of One Six Right is actively working on another yet to be named aviation documentary. I am shipping the DVD back to Netflix so another pilot or aviation enthusiast can enjoy the film and will be ordering a copy of both One Six Right and One Six Left for my personal DVD collection. I would have to agree with you; I absolutely love both One Six Right and One Six Left. The fly-by shots are absolutely stunning. That and I love the soundtrack. I had no idea that they were going to make another aviation documentary. I'm excited for it. Thanks for the update. One Six Left is what spurned me to finally get moving with my flight training. I'm a visually creative person for a living, and the cinematography of this film really hit me hard. I was lucky to have first watched it in 1080 resolution on a 50" Plasma TV. P.S.- Thanks for the comments on my blog, 42andflying.blogspot.com I do appreciate you taking the time to do so. Totally agree about and love both Six Right - will check out One Six Left now. Cheers. Thank you very much. I haven´t seen none of both films, but now I´ll get them. Thanks again! Great, I'll have to agree with you.